This sign is for California Dairy Industries Association Dairy of Merit. The sign’s colors are blue, red, white, and gold. 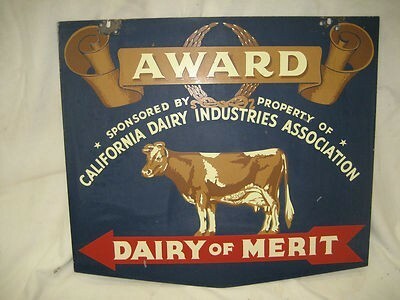 The text on the sign reads: Award Sponsored by property of California Dairy Industries Association Dairy of Merit. The sign shows a cow in the center with scroll work and text above and below.